Blue Spruce Farm is the Audet family’s third generation dairy farm whose herd of 1,500 cows (mostly registered Holsteins) produced over 4.3 million gallons of milk in 2014. The family is one of the 1,200 dairy farm owners of the Agri-mark Cooperative, makers of internationally recognized Cabot cheddar cheese. Blue Spruce was the first Green Mountain Power Cow Power farm project in Vermont, and currently turns manure and other agricultural products into methane gas to produce enough renewable electricity to power more than 400 homes. Recently the Audet’s worked with GMP to add a 100-kilowatt wind turbine to their renewable energy portfolio. The turbine, manufactured in Vermont by Northern Power Systems, generates enough electricity to power more than 20 homes. Learn more about Blue Spruce Farm. Ashley Farr, a third-generation farmer, and his wife Erin, milk 60 cows at their farm in Richmond. 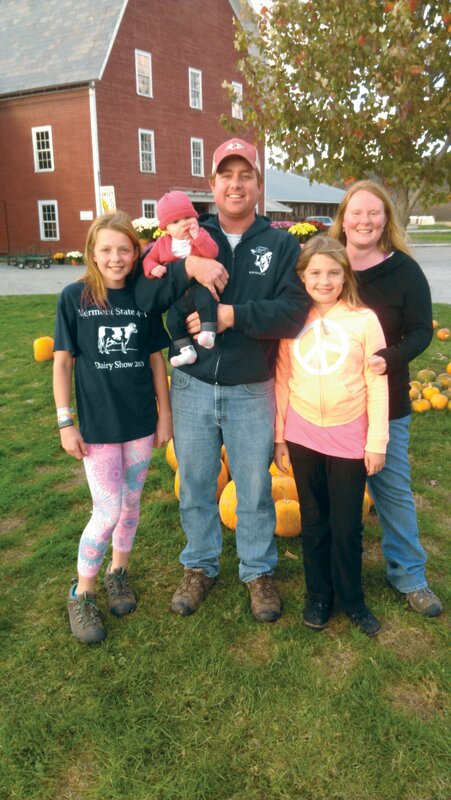 The Farr’s are one of a growing number of Vermont farms to embrace new robotic milking technology. In 2012, they purchased a Lely A3 Robotic Milker, which allows their cows to determine their own milking schedules. The robots are fully automated. Cows walk into the machine on their own, and once inside lasers guide the suction apparatus to their teats. Each cow wears a transponder around its neck, which syncs with the robot and monitors the cow’s milk production. The Farrs say the robot has provided them with a more flexible schedule, which is helpful because their growing family keeps them very busy with 4-H, school sports, and activities. Learn more about Farr Farm. 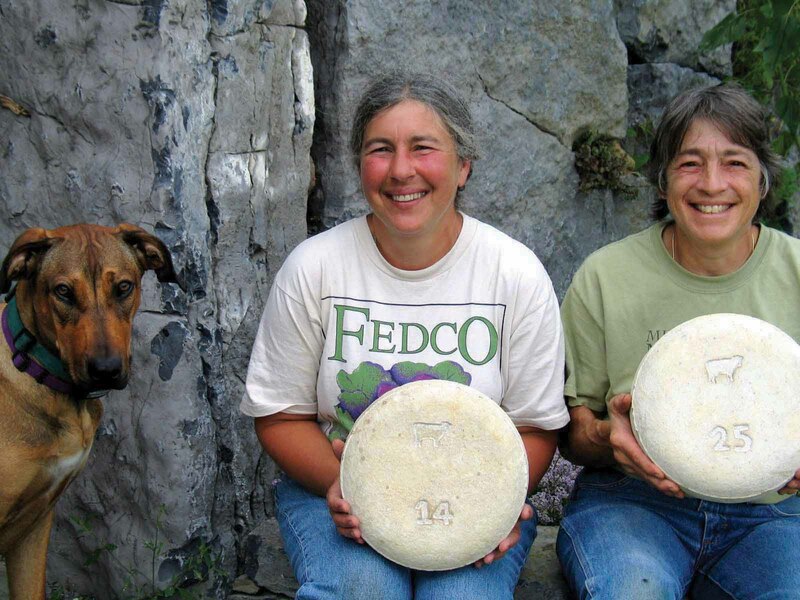 Pioneering artisan cheesemakers and organic farmers Marjorie Susman and Marian Pollack have been producing outstanding farmhouse cheeses from their herd of seven Jersey cows since 1982. They produce just 7,000 pounds of their hand-crafted waxed and cave-aged cheeses each winter, and run a thriving organic vegetable farm every summer. Learn more about Orb Weaver Farm. 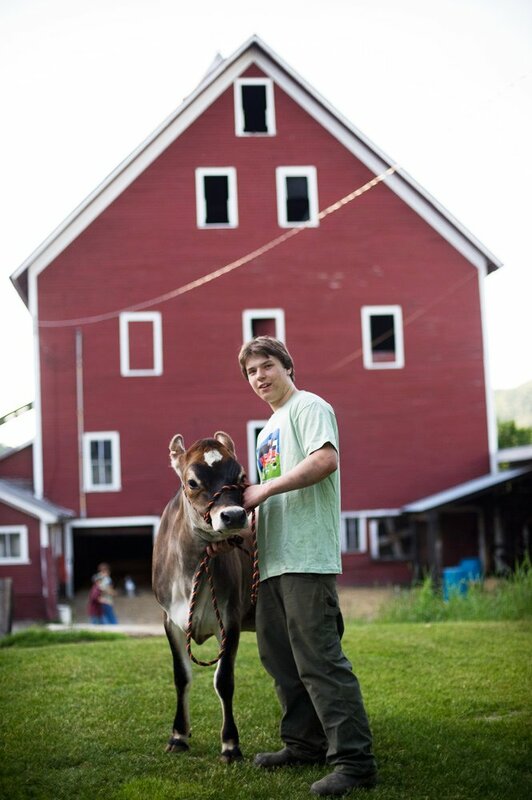 Rock Bottom Farm in Strafford, Vermont is home to Strafford Organic Creamery. Owner, Earl Ransom grew up milking cows on this 600-acre farm. He and his wife, Amy Huyffer, carry on his family’s tradition of managing the land organically, with no herbicides, pesticides or chemical fertilizers. With mostly Guernsey cows, their herd of 50 grazes on rotational pastures for the entire growing season. Everything done at Strafford Organic Creamery, from the crops they grow for them to the gentle routines of milking, is focused on the cows’ comfort and well-being, and helping them create super-tasty milk and cream. Strafford’s line of ice cream is made in small batches, one day each week. They separate fresh eggs by hand, handpick the mint and black raspberries, grind the coffee just before we brew it into the milk and basically work their tails off to make the best ice cream on the planet. 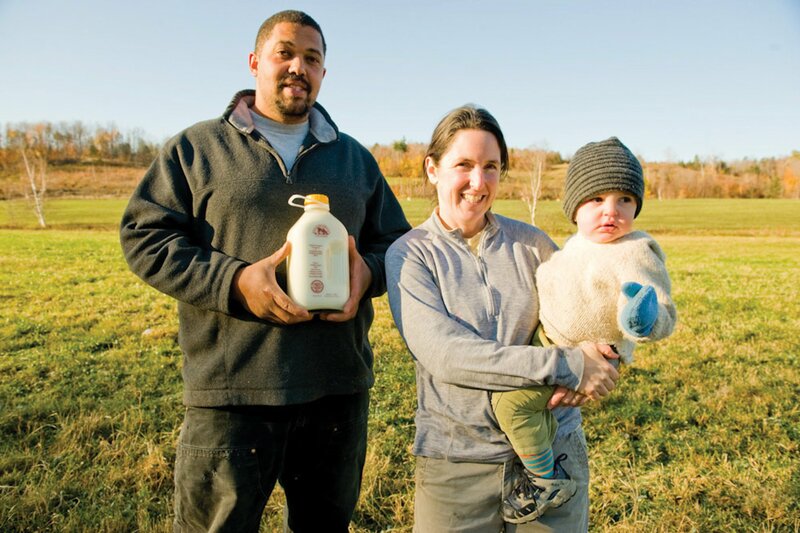 Learn more about Strafford Organic Creamery at Rock Bottom Farm. Since 1984, Beth and Bob Kennett have offered farm vacation experiences to guests from around the world on their beautiful valley farm in Rochester, Vermont. 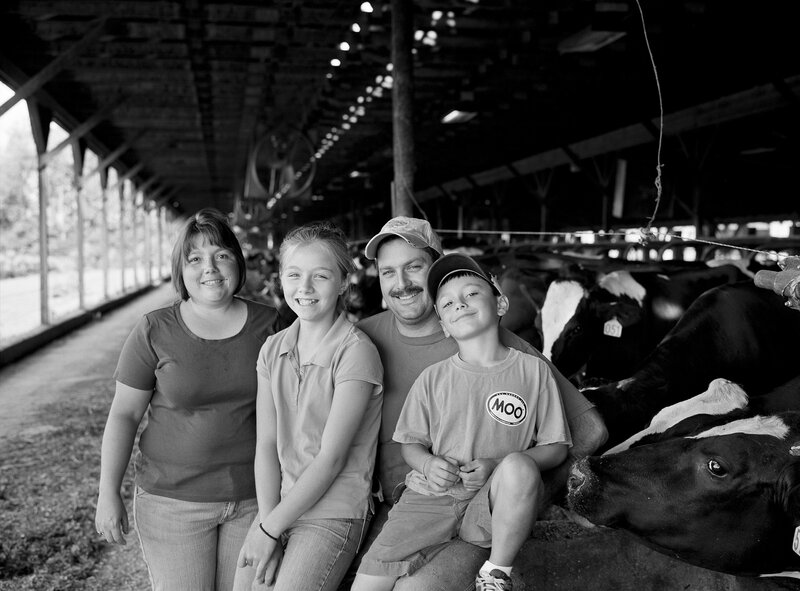 The family, Bob and Beth (parents); David (son) and his wife Asia along with their daughter Ella manage the 220-acre farm to produce milk and accommodate their guests. They milk from 7 a.m. to 10 a.m. and 7 p.m. to 10 p.m. so the guests can observe the milking after breakfast and again after dinner. David is their “cow man”. Tom is their “crop man” and is in charge of growing the feed and feeding the cows. The farm is also Vermont’s first certified “Green” agritourism enterprise. They have installed various energy-efficient initiatives in the barn including a heat exchanger to heat hot water, and a variable frequency milking system that reduces energy consumption. In addition, they have worked on a number of environmental stewardship initiatives with stream bank restoration projects, erosion control, and land conservation. The guest business has qualified as a Green Hotel in Vermont and is a member of the national Green Hotel program. Learn more about Liberty Hill Farm. Monument Farms milks about 460 cows and manages approximately 2000 acres in the lower Otter Creek river watershed. The long term investment in the processing and bottling allows Monument to serve as a direct wholesaler of Vermont milk to many regional outlets. Monument strives to be environmentally conscientious, believing that, to be sustainable, every decision must be made with an eye to the long term benefits and impacts to the land. Monument Dairy has been following a nutrient management plan for several years and strives to exceed the state’s regulations regarding water quality. Best management practices are in place for all aspects of the farm’s waste management systems. The farm continually rotates crops to lower soil erosion, applies manure based on calculated agronomic rates, maintains buffers on all fields along waterways, and continues to look for ways to improve on its overall soil fertility. The James and Rooney families take a great deal of pride in producing some of the finest dairy products in the state in a sustainable manner, ensuring that Vermonters have a long-term supply of fresh local milk. Learn more about Monument Farms. 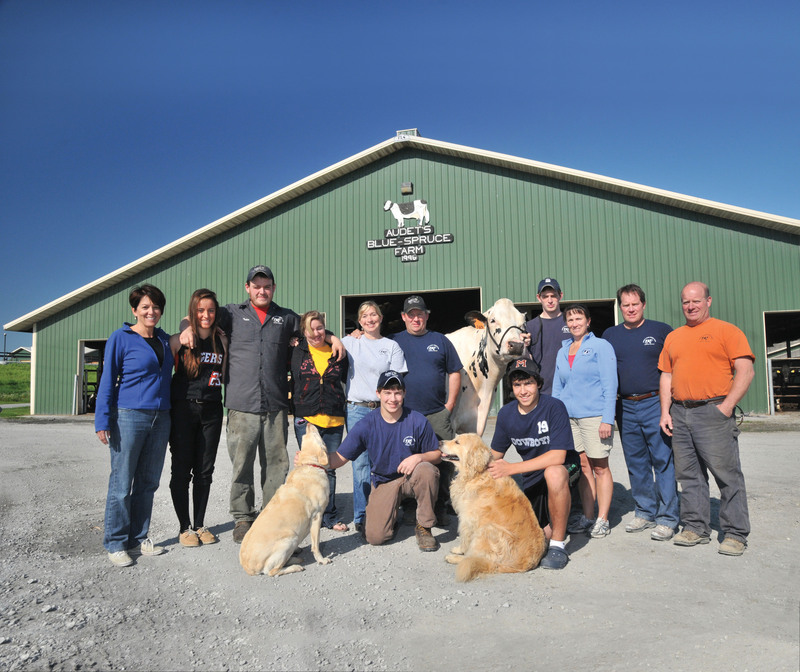 The Foster Brothers farm began its dairy operation in 1941 and incorporated in 1971. Today, the farm covers 1537 acres in Addison County. The dairy has a herd of more than 630 cows, of which more than 370 are milked. The herd produces over 10.8 million pounds of milk each year. During the energy crisis of the late 1970’s, Foster Brothers Farm started producing more than milk to keep the family business going strong. They began producing electricity from cow manure (and continue to do so today). This electricity is used to provide power for the farm and the excess is sold to the local utility. To produce the electricity, the Fosters built an anaerobic digester which uses bacteria to break down the manure into methane gas. The methane gas is used as a clean burning, environmentally safe source of fuel for electrical generation. Not satisfied with simply recovering energy from the manure, the Fosters used their “Yankee ingenuity” to take the process of digestion a step further. The Fosters began composting in 1989. Learn more about Foster Brothers Farm and Vermont Natural Ag Products.